Apatura iris (Linnaeus, 1758) is recorded for the Republic of Khakassia (South Siberia) for the first time. Korshunov, Y.P. (2002). Butterflies of Northern Asia. Moscow: KMK-Press. (In Russian). Knyazev, S.A. & Kosterin, O.E. (2003). 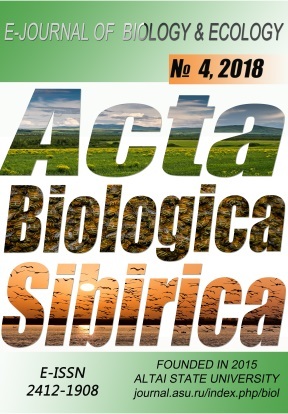 New records of nemoral butterflies Apatura iris (L., 1758) and Maniola jurtina (L., 1758) in West Siberia and their probable zoogeographical significance. Euroasian Entomological Journal, 2 (3), 193-194. (In Russian). Knyazev, S.A. (2009). Butterflies (Lepidoptera, Diurna) of Omsk Province, Russia. Euroasian Entomological Journal, 8 (4), 441-461. (In Russian). Kosterin, O.E., Knyazev, S.A., Poteiko, A.A., Ponomarev, K.B., Kosheleva, T.F. & Teploukhov, V.Yu. (2007). New records of butterflies (Lepidoptera, Rhopalocera) in Omskaya and Tomskaya Oblast’. Euroasian Entomological Journal, 6 (4), 473-482. (In Russian). Ivonin, V.V., Kosterin, O.E. & Nikolaev, S.L. (2013). Butterflies (Lepidoptera, Diurna) of Novosibirskaya Oblast, Russia. 3. Nymphalidae (without Satyrinae). Euroasian Entomological Journal, 12 (2), 177-199. (In Russian). Perunov, Yu.E. (2017). New and rare moths and butterflies (Lepidoptera: Noctuoidea, Geometroidae и Papilionoidea) from Altai krai (Russia). Altai Zoological Journal, 12, 3-5. (In Russian). Yakovlev, R., Naidenov A., Perunov Yu. & Artemiev, R. (2014). First record of Apatura iris (Linnaeus, 1758) in Altai Krai, Russia (Lepidoptera: Nymphalidae). Entomologist’s Gazette, 65, 11-14. Yakovlev, R.V. & Kostyunin, A.E. (2015). Range expansion of Apatura iris (Linnaeus, 1758) in Siberia (Lepidoptera: Nymphalidae). SHILAP Revta. lepid., 43(170), 305-308.